Iceland has experienced an enormous tourist boom during the past decade. Visitors from all over the world come to see the countless geographic wonders and otherworldly wilderness. Whilst the majority of tourists stick to the ‘Golden Circle’ of sights in close proximity to Reykjavik, those in the know head to other parts of this amazing country to explore the lesser-known wonders. Skiing in Iceland is still relatively below the radar. It’s not surprising given there are well over 1,000 ski resorts in the European Alps offering phenomenal infrastructure, services and most importantly skiing. However, for the adventurers out there, North Iceland is dotted with picturesque ski fields that offer something different. Whilst North Iceland’s ski fields are smaller than the large ski fields in Europe, they more than make up for it with the utterly breathtaking vistas. 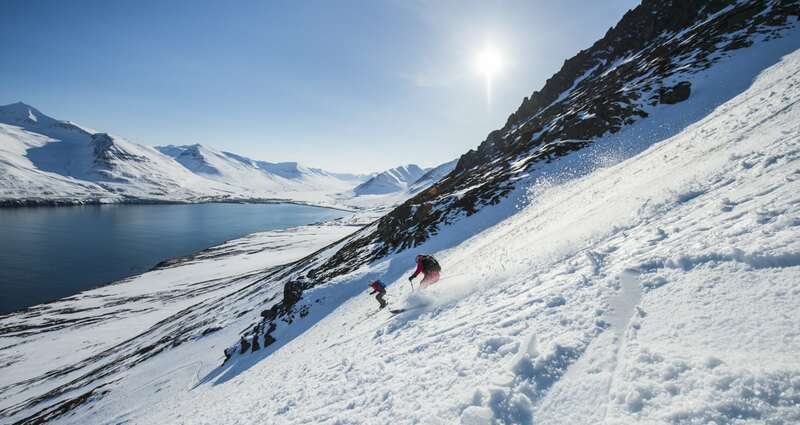 Where else in Europe can you ski down to sea level, with a view of a fjord or the open ocean? The ski areas in North Iceland each occupy their own niche in the region’s mind-blowing landscape. For undiscovered scenery, the possibilities for backcountry skiing are endless (Troll Peninsula is the centre of backcountry activity). The terrain looks as though it had been hand crafted for ski touring, Cat skiing and Heli Skiing are both activities on offer for the expert skier. 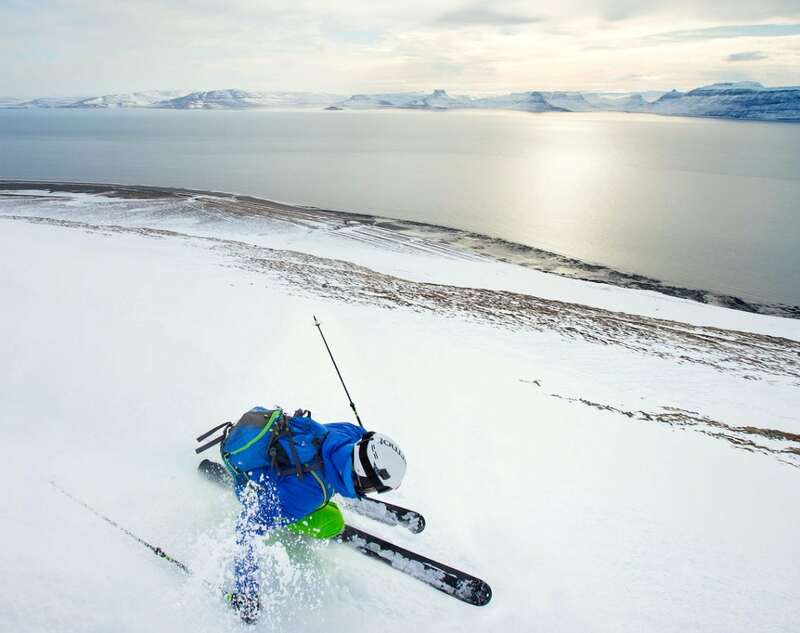 Skiing on virgin slopes all the way down to the Arctic Ocean is what characterizes this skiers´ paradise. Not only that, some of the skiing areas accommodate night skiing so it’s even possible to ski under the Aurora (aka the Northern Lights). What could be better than that? 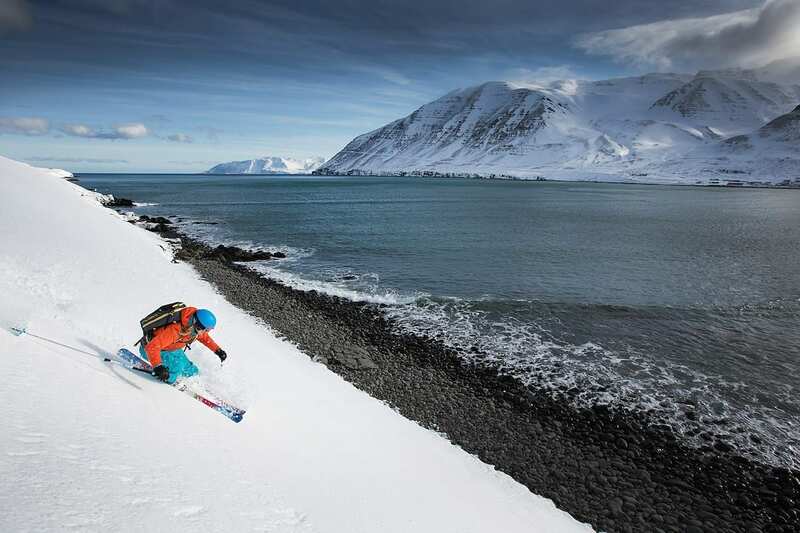 In North Iceland it’s possible to buy a pass allowing visitors to explore all of the main five ski areas. The 5×5 Ski pass (available from www.skiiceland.is is a ski pass that serves all of North Iceland resorts. This means that you can ski in five resorts for five days. If you want to ski at one resort for four days and then do another one for one day that‘s fine. You get the idea. There are excellent facilities for cross-country skiing, sport tours and extreme sport experiences. As mentioned, you’ll also find heli-ski and cat-ski operators if you’re brave enough to explore areas well off the beaten track! We explored Akureyri and Siglufjörður which, in terms of feel, were reminiscent of the early North American ski fields like Mt. Mckenzie in the Rockies. Lifts and facilities are charmingly basic, but you’ll not find crowds here – just the thing that you came for, snow, scenery and skiing. Best of all, the season is long, running from November through to May. Both Akureyri and Siglufjörður are nestled above the fjord, with views out towards the Atlantic Ocean. Iceland as a whole has benefited from the expansion of Reykjavík–Keflavík Airport. This has resulted in daily flights from the UK, several with low cost airlines. The flight time from most UK airports is normally just over 2.5 hours. You can fly to North Iceland using an internal flight, or there are increasingly direct flights to the amazing town of Akureyri, which is minutes from the ski fields. 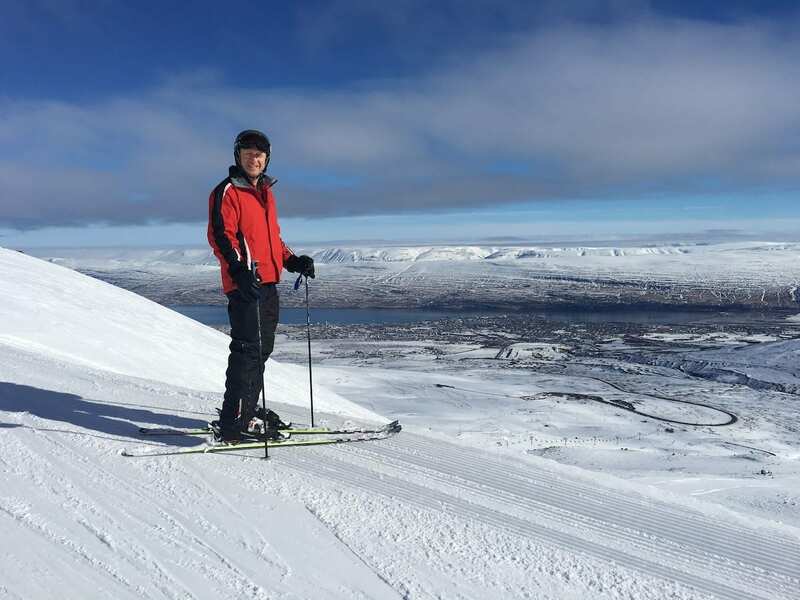 Flying direct to Akureyri cuts out virtually all transfer time, which for anyone who skis regularly will tell you, is a godsend. 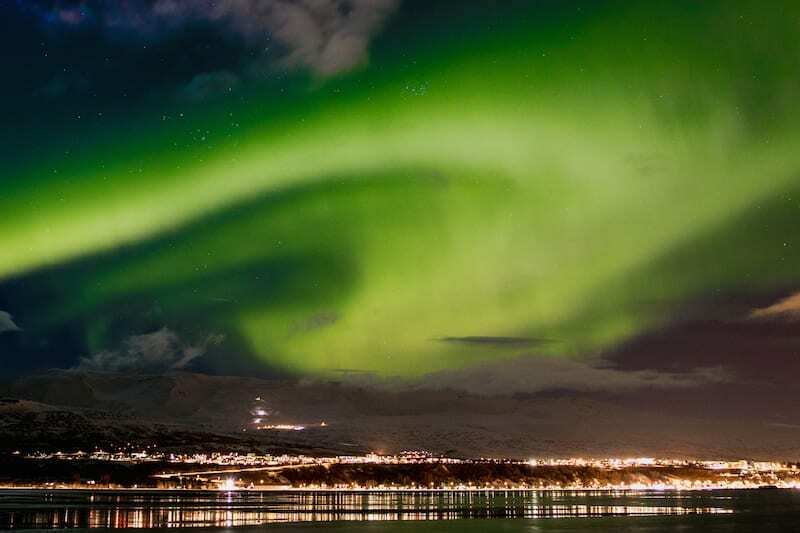 Travel firm Super Break are offering direct flights to Akureyri from various local and regional UK airports. You can book packages with a selection of planned excursions (such as whale watching or Northern Lights excursions), but then have time to do some activities on your own, including skiing. You can also read about other ways to get to Akureyri here. North Iceland is perfect for a family ski holiday. Not only does each ski field offer slopes and lifts suited to both children and adults, the hills are generally much less crowded than European resorts. They are also much smaller, meaning that you don’t need to worry about your children getting stranded in another resort (or even another country – yes that has happened to me!). The short flight times and tiny transfer times (if flying direct to Akureyri) also make this a great option for those travelling with kids. If like me, you’re a keen skier or snowboarder, but your wife hates snow sports, the bonus of North Iceland is there is a lot else on offer. Such is the close distance from the towns, the ski areas are phenomenally accessible making them perfect for weekenders who fancy a spot of snow sport in-between the scores of other activities on offer. In North Iceland you’ll find landscapes among the most breathtaking in the world. Stunning fjords, beautiful coastal highways, waterfalls of the gods, epic volcanoes, snowy mountains, hot springs and natural baths everywhere. The quaint historic fishing settlements nestle beside fjords, oozing with character and gastronomic delights. They host the finest eateries, craft breweries, luxurious spas, and boutique hotels and shops. Visitors can enjoy whale-watching tours in the fjords, and dozens of locally run excursions that provide nature lovers access to the otherworldly wilderness. What’s more, visitors have higher chances of seeing the mesmerising Northern Lights here too. During the ski season there is a 90 per cent chance of seeing the Northern Lights if you stay in North Iceland for five nights or more. To increase your chances you can book local tours that take you out to the wilderness, away from any light pollution. Whilst Brits go to the pub after work, Icelanders go to the pool. Not your average public swimming pool either. Instead, geo-thermal pools with hot-tubs, spas, saunas, steam rooms and even water slides for the kids (and adults). Perfect for every member of the family.